Famous in the whole Europe Piotrkowska Street stretches the length of 4.2 km, running south in a straight line between Freedom Square (plac Wolności) and Independence Square (plac Niepodległości). This street is the longest commercial street in Europe. It is the Piotrkowska Street which forms the central part of Lodz, around which the city was built. During the World War II it was severely damaged, but since 1990 works have been carried out to gradually restore its former glory. A complex of textile factories (cotton mills) and associated facilities, built in the city of Lodz in 1824. The largest among commercial and entertainment centres in Poland and one of the largest in Europe. 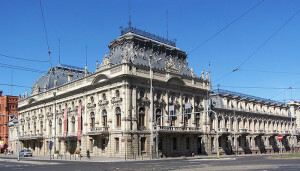 It opened on May 17, 2006 in Lodz. Manufaktura is located between Zachodnia, Ogrodowa, Drewnowska and Karski streets. It is a former factory complex of Izrael Poznanski. The Israel Poznanski’s Palace – the 19th century palace located in Lodz. It was originally designed as a commercial and residential property: it all began with a purchase of a residential building with a modest elevation and a storage building by Israel in 1877 (a property at the intersection of Ogrodowa and Zachodnia streets), leading to multiple transformations in the style of the French Neo-Renaissance and Neo-Baroque during years 1888 -1903, according to the project made by Hilary Majewski. The reservoir was built in 1926 and designed by William Lindley Heerlein, whilst the works were overseen by Stefan Skrzywan. The water accumulating in the reservoir was used for periodic cleaning of the canals in the centre of the city. The tank has the capacity of 300 m3 of water, and is 142 m long, 187 cm high and around 1.5 m wide. The official opening of “Dętka” took place on April 28, 2008, and it was made available to the public two days later. The White Factory is the name of the building of Ludwig Geyer at 282 Piotrowska Street in Łódź. It is a complex of neoclassical buildings, one of oldest examples of Poland’s industrial architecture. It was built in 1835-1837. The White Factory had the first mechanical spinning and weaving mills in Łódź. Karol Scheibler’s Palace – a neo-Renaissance palace built for Karol Scheibler, located in Łódź at Victory Square 1 (Plac Zwycięstwa) next to the huge complex of his factories and factory workers’ housing ‘Księży Młyn’. The Art Museum in Łódź – its main focus is the avant-garde art, documenting its history and working on its update. The institution has three divisions: ms1, ms2 and Herbst Palace. Founded in 1930, it is the second oldest museum of modern art in the world. A botanical garden in Lodz, founded in 1929 in the Park Źródliska. After the end of the World War II, in the area adjacent to the Park na Zdrowiu the creation of a new botanical garden commenced. The area of ​​the garden is 67 hectares (including 2 hectares covering the original botanical garden in the Park Źródliska and the Palm House located there), which means that it is the largest botanical garden in Poland.